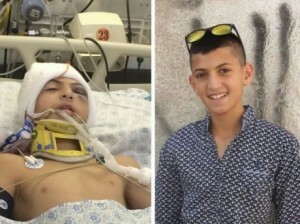 Among those injured this year is 12-year-old Ahmad Abu al-Hummus (pictured). Ahmad was shot in the head last week as the Israeli army invaded his suburb of East Jerusalem and fired live ammunition, gas bombs and rubber-coated steel bullets at civilians. He is now in a critical condition in hospital.